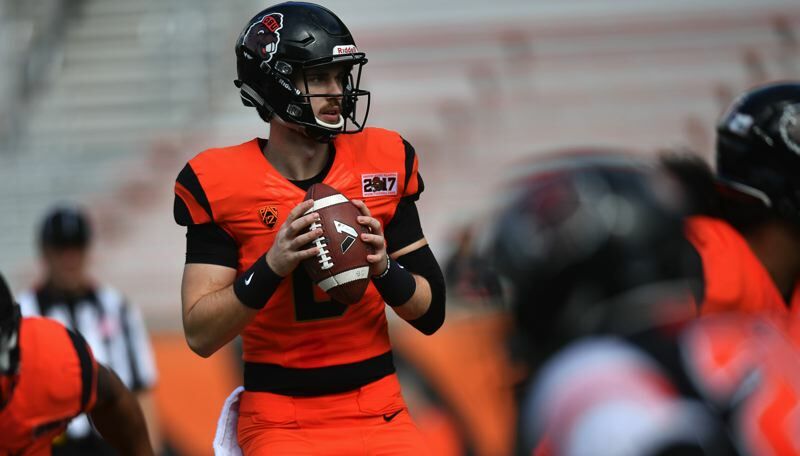 • The Beavers held a lot of veteran players out of action for various reasons — mostly minor injuries — which allowed some of the understudies to show what they can do. "We had some young guys who needed some reps,"coach Jonathan Smith said. "It was awesome to see them get turns, and there was some good exchange out there. I'm pleased with where we're at heading into the last week of spring ball." Oregon State will practice Tuesday and Thurday and then end its 15-practice session with the spring game at 11 a.m. Saturday at Reser Stadium. Among the players who sat out Saturday's scrimmage were running back Jermar Jefferson, receivers Isaiah Hodgins, Trevon Bradford and Tyjon Lindsey, linebacker Addison Gumbs and safety David Morris. With the three projected starters at receiver on the sidelines, a pair of youngsters took advantage of the extra opportunity to haul in touchdown passes — redshirt freshman Jesiah Irish and true freshman Anthony Gould, the latter straight out of West Salem High. Irish's scoring catch was for 32 yards from Jake Luton; Gould's 75-yard run-and-catch to paydirt came on a ball thrown by Aiden Willard. "We have other guys who can go out there and operate," Smith said. "That (receiver) group as a whole, we're deeper than we were last year. "Jesiah has had a great spring, and he had a really great offseason. Gould makes plays. For a kid who is supposed to be in high school right now, as impressive as he is athletically, I'm pleased with how sharp he is. We're playing him at a couple of spots, inside and out, and he's handled it fine." The 5-11 Irish — who has gained about 10 pounds from a year ago and now weighs 185 — will push Hodgins, Bradford and Lindsey and could be part of a receiver rotation that includes sophomores Champ Flemings, Kolby Taylor and perhaps Gould. "Jesiah is an explosive player," Luton said. "He has all the tools a kid needs to continue on and be successful in college, and even beyond that. The biggest thing for him is the mental side of it. To be thrown into a role where he's having to learn on the fly is good for him. "A guy like that who has such good body control and can create separation at his size. ... it's big-time. I love throwing him the ball and playing with him." Luton on the 5-10, 160-pound Gould, who graduated early from West Salem to enroll at OSU in January: "To be as young as he is and play as well as he has been, he's doing a really good job. I'm impressed with him." "Jesiah and Anthony are doing really well," receivers coach Kefense Hynson said. "They just have to keep growing. It's good for them to get these reps. Spring ball is for these guys to get better. They're making freshman mistakes but learning from them. They're going to be good players." "We have a special group," said Irish, who is also a contender for the punt and kickoff return role along with Bradford. "Everyone can play. Every day, we're competing, working hard, pushing each other." • Quarterbacks Luton, Tristan Gebbia, Nick Moore and Willard had their moments on a cold, blustery spring day. The lanky senior looked fit, his arm strong and his decision-making mostly good. "That's what he has been the whole spring," Smith said. "He has really improved from last all, just his comfort level. He was sharp today." The 6-7 Luton, who has weighed as much as 235 during his time at Oregon State, is down to 220. "I spent the winter bulking up a little bit, and this is the time to slim down," he said. "Over the next four or five months, hopefully I'll be able to keep building up some good weight and getting to about 225. "But I feel great. I'm in the best shape I've been in a long time." The 6-2 Gebbia has gained about 15 pounds, pushing him to 205. "I feel stronger," said Gebbia, running second at QB behind Luton. "I'm feeling more comfortable in the offense. Coach (Brian) Lindgren has a great scheme. I'm just working to get better every day." "Tristan is operating well," said Smith of the sophomore transfer from Nebraska. "He's still a little bit new. He'll continue to progress." • The offensive line is taking shape, even with the leading contender at center — graduate transfer Nate Eldridge from Arizona — still completing his academic requirements in Tucson. Seniors Blake Brandel (6-7, 305) and Gus Lavaka (6-4, 360) anchor the left side at tackle and guard. Senior Clay Cordasco (6-5, 315) and sophomore Brandon Kipper (6-6, 280) man the right side at guard and tackle. Nous Keobounnam, a 6-2, 285-pound walk-on junior from Centennial, is running with the "ones" at center. "Nous has always been a backup guy, but he's making a move," Lavaka said. "He's taken charge at center, and he's going to be hard to move out of there." Jake Levengood, a 6-4, 285-pound redshirt freshman, and Joshua Gray, a 6-4, 280-pound grayshirt freshman, are challenging for playing time on the O-line, too. "Joshua has had a nice spring," Smith said. "We're young as a group, but heck, Blake and I feel like we're still young," Lavaka said. "We feel like we have a long way to go, but we're getting there." • OSU's defense had nowhere to go but up from last season's abyssmal performance, and it's clear strides have been made. The front seven put some pressure on OSU's quarterbacks through the scrimmage. "We were running for our lives a couple of times out there," Gebbia said with a smile. "I felt good about the defensive energy," Smith said. "We tweaked some things in the defensive schemes. We have a lot of things in defensively right now. We're not a finished product, but we've progressed on that side of the ball." The addition of Jordan Whittley — a 6-2, 340-pound transfer from Laney JC in Oakland, California — has added bulk and strength at noseguard. "He's making an impact on the D-Line already," Lavaka said. "Jordan and Elu (Aydon, a 6-3, 385-pound senior) are two big guys who can disrupt things at the line of scrimmage." • Oregon State's strength on the defensive side could be at linebacker, with plenty of experience but also youth on the depth chart. Only two of the projected top nine players are seniors — Andrzej Hughes-Murray and Shemar Smith. Contending for starting jobs on the inside in OSU's 3-4 scheme are Smith, junior Doug Taumoelau, sophomores Avery Roberts and Isaiah Tufaga and true freshman Omar Speights out of Crescent Valley High. Battling for spots on the outside are Hughes-Murray and sophomores Matt Tago, John McCartin and Addison Gumbs, the latter a transfer from Oklahoma who is sitting out the spring as he rehabs from ACL knee surgery. "Omar is doing really well, Shemar has gotten a lot better, Isaiah has gotten a lot better," linebackers coach Trent Bray said. "Our emphasis is trying to do some new things, including to apply more pass pressure. We have to be better blitzers. We have to get home. Guys have bought into it and improved."